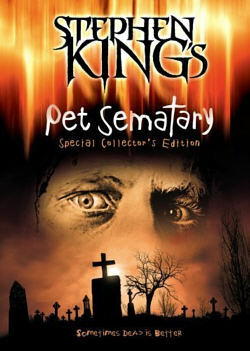 According to Twitch, the remake of Stephen King’s Pet Sematary is ready to go with a script by Matt Greenberg, writer of the spooky 1408 and the outrageous Reign of Fire. Paramount has begun looking for a director, and first in line is Alexandre Aja, the director of last years Piranha 3D*. Pet Sematary tells of a blossoming family that moves to Ludlow, Maine and happens to live near an abandoned Indian burial ground. After an accident with the family cat, patriarch Louis Creed discovers that whatever is buried in this hallowed ground returns to life. When tragedy strikes a few months later, Louis must decide whether or not to use the magical ground again. But the resurrected cat has been acting a bit dodgy as of late…. Aja has shown talent with the aforementioned Piranha as well as The Hills Have Eyes and I’m sure he’d knock this right out of the park. We’ll keep you posted as the deal (and film) develops. *Which is honest to god a spectacular “It’s midnight and we’ve all had a few beers let’s check it out” movie. One of my favorites from 2010. Comments for The “Pet Sematary” Remake May Have A Director are now closed.